BY LINDSAY HARRIS-FRIEL FRINGE CORRESPONDENT Describing Armageddon at the Mushroom Village as the performance of a mask and physical theatre ensemble, using mythic themes to show a story about how foolish pride can bring about the end of the world would be pretentious and distancing. Instead, let’s just say that what we have here is a funny, satirical look at a famous cartoon. Meet The Burps. 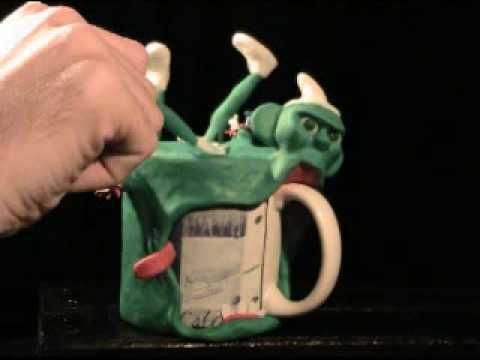 The Burps are a simple, happy tribe of green, humanoid creatures with white hats and clothes and bulging eyes. Their life is perfect, full of singing and dancing, until the undercurrents of their basic personalities cause them to commit selfish actions, causing fates worse than death. Using music, physical discipline and animated film, Terry Brennan and Jay Wojnarowski’s conception inexorably dances its way through bitterness and despair to an end that makes Pink Floyd’s “The Wall” look like Steamboat Willie. The cast, Tim Carmello, Jess Conda, Miranda Libkin, Jamie McKittrick and Gigi Naglak, have crafted Burps as sweet as bedtime stories, flexible and energetic as healthy young ferrets, and tragic in their hubris as all heroes of Greek drama. Put your thinking cap on for this one, and bring your sense of humor. BY LINDSAY HARRIS-FRIEL FRINGE CORRESPONDENT The best Fringe experiences are often the ones who arrive with little fanfare, almost sneaking up on you, and tell you a compelling story as simply as possible. Hermitage is one of these experiences; it’s a ghost story, a love story, and a tragedy with some lovely black humor. Frederick Andersen has created a play about The Collyer brothers, famous for their lives as reclusive hoarders, in a brownstone in Harlem, New York City. So secretive were they that they managed to cloister themselves off from society, completely missing World War I, II, and the Harlem Renaissance. Andersen’s story is very much the male version of Grey Gardens. Two people who nearly mirror each other are trapped in their crumbling memories and faded glory, slowly driving each other insane, too codependent to leave each other and too stubborn to die. Seeing this play on the third floor of Plays and Players is deliciously fitting, as if you’re sneaking into the darkened, locked room at the top of the stairs. Spoken inventories, like rhythmic, sonorous walls, describe the Collyers’ home as having everything from newspapers to pianos and musical instruments dating back to the 1700’s, entire libraries of medicine and law, even medical specimens such as skulls, a spinal cord, a two-headed baby in a jar. Creating this collection would be worthless compared to what the actors’ movement and attitudes define, and force out of our imagination. Thomas Weaver, as Langley, the last man standing in the Collyer home, moves through the empty space like a ninja in a labyrinth that could collapse at any time, stringing booby traps to keep out intruders and mining out objects precious with sentimental value. Meanwhile, Christopher “Jumbo” Schimpf, as Homer, is the brother imprisoned in his own body by illness. Schimpf and Weaver create a pair of brothers that are warm, gentle and funny, but tragic and more than a little scary in their fragility and inability to let go of the past. The cable between the Collyers and the real world is Miss Miriam, a kind and steady neighbor played by Wendy Staton, whose focused and compelling portrayal shows us the changing world around the Collyers from which they hide. Stanton then shows her sharp flip side as Helen Warden the journalist, digging away at Langley. The other women in their lives trap or reject them, such as in the case of their mother, portrayed by the regal Alana Gerlach, and Langley’s breath of fresh air, Olivia, played with nubile innocence by Kate Wand. Andersen also portrays the loving but emotionally remote patriarch Collyer, and it’s clear from the chemistry between Andersen and Gerlach that the parents’ emotional issues set the foundation for their sons’ entrapment. 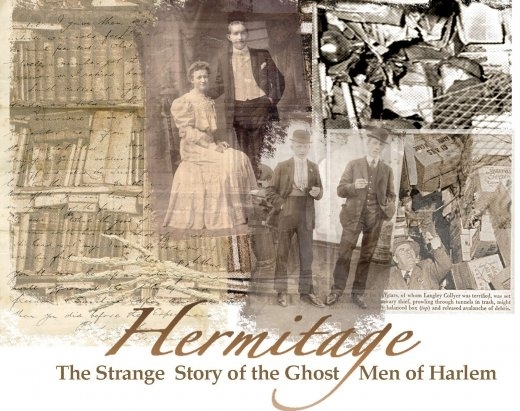 If a ghost is the spirit of a deceased person who, for some reason, has unresolved issues in their past of which they cannot let go, and throughout their afterlife are forced to repeat these actions in this world, instead of moving on to the next, then Hermitage is perfectly a ghost story in this regard. So much has been speculated and so little substantiated about the Collyer brothers that to write any play about them is a tremendous undertaking, in separating fact from fiction and telling a fair tale. Andersen’s tale is loud and clear when it comes to the central issues; loneliness and co-dependence, entrapment and love, the importance of objects versus the importance of experiences and memory. See it with someone you love enough to set free. This entry was posted on Tuesday, September 8th, 2009	at 11:40 am	and is filed under News	. You can follow any responses to this entry through the RSS 2.0	feed. You can leave a response, or trackback from your own site.